Sean performed on Show 326 in Cleveland, OH, on June 7, 2016. 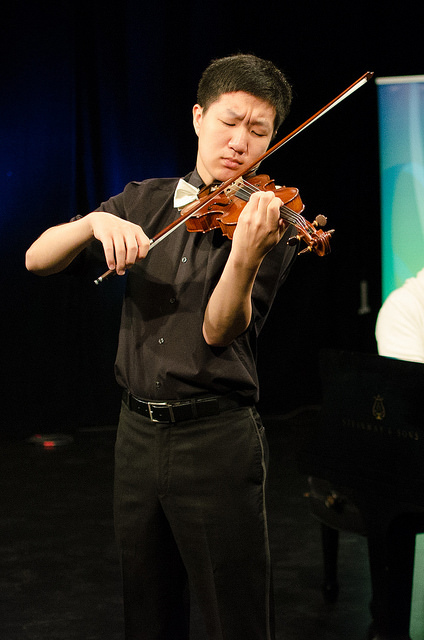 Sean Lim (violin), 17, hails from Shaker Heights, Ohio, and is enrolled in Cleveland Institute’s Young Artist Program. He studies violin with Jaime Laredo and Jan Sloman. He was one of the youngest participants in the International Boris Goldstein Violin Competition and has performed all over the East Coast. In his free time, Sean loves to sleep and dream with great imagination. Sean performed Introduction and Rondo Capriccioso, Op.28 by Camille Saint-Saëns, with Christopher O’Riley, piano. Sean also performed on the show as one of the members of the Cecilia Octet. He moved to Ohio from the Washington D.C. area last year to participate in the CIM Young Artist Program.